After picking up some Peridot, I sewed this. 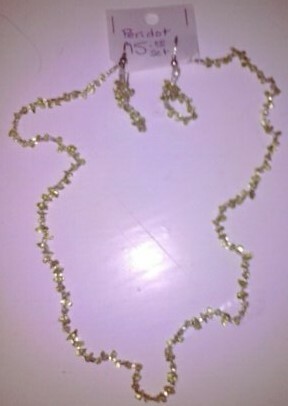 I found the larger beads and decided to sew this necklace. 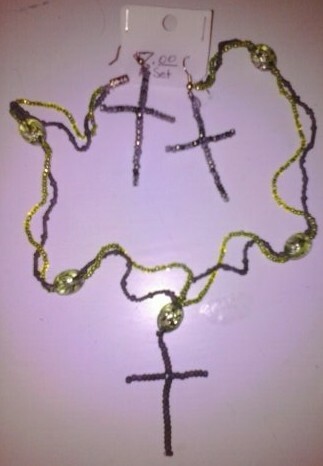 It seemed like it needed more, so I all added the cross made from wire, then made earrings to match. I found a Metal Rose choker and had to make a change. 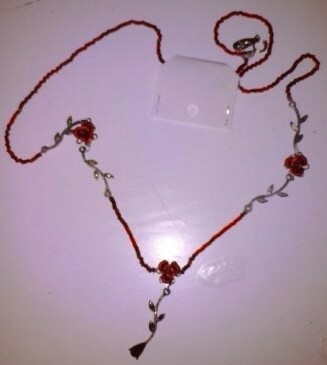 So, I beaded this necklace. 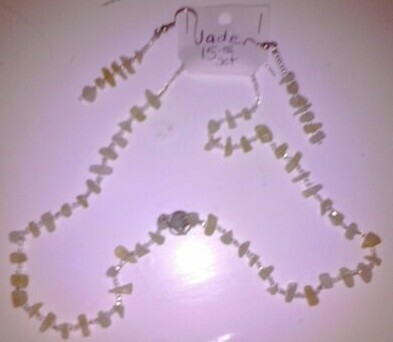 After picking up some jade beads I sewed this set of earrings and necklace. Yet another shirt I shrunk out of. I hand sewed it to take it in around the bust. Then crocheted trim to it and from there became this. It looks great on. 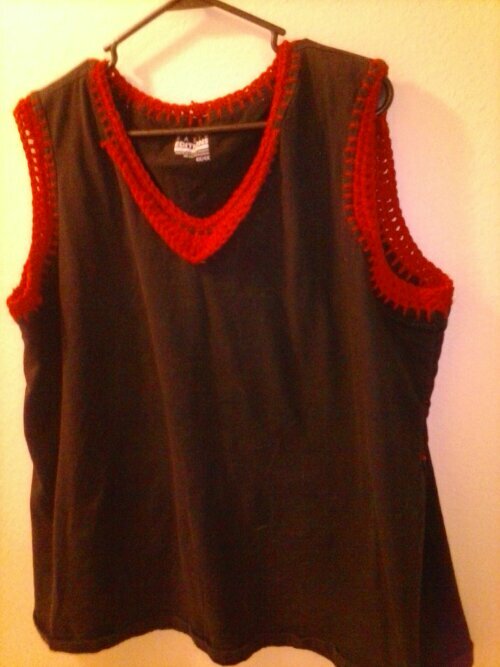 I should mention, when crocheting down the neck, you must tack it on to the shirt. In losing weight, I was left with tons of clothes that are too big. This was a pair of jeans that I cut the legs off of and took in by sewing by hand. So the trick here is to choose a pattern. 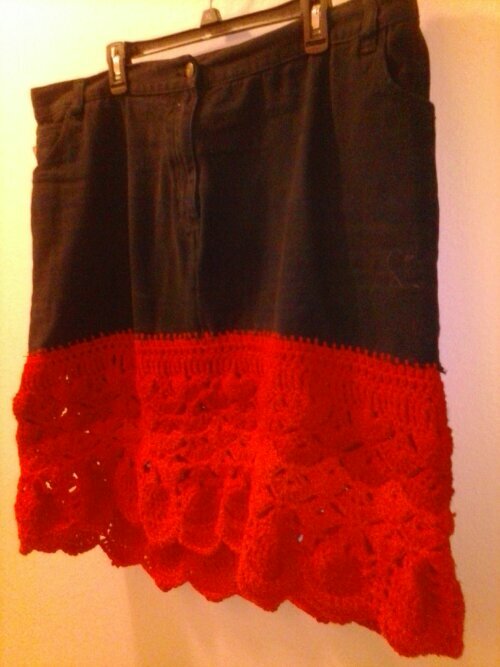 Sew some yarn to the bottom of the skirt. From the yarn, crochet a pattern that leavs small holes to show off your legs. It doesn’t show off much. These are so easy to sew. I found everything I needed at the Dollar Tree. In the flower section was the butterflies. Pull them off the stem and cut off excess plastic. 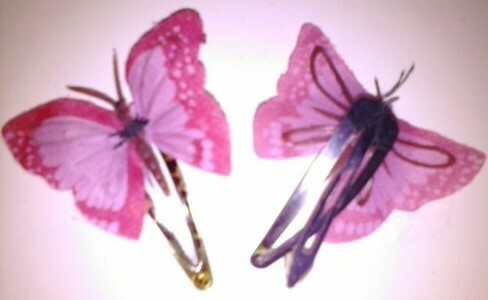 Sew onto hair clips. Can be tricky, But super cute in your hair.